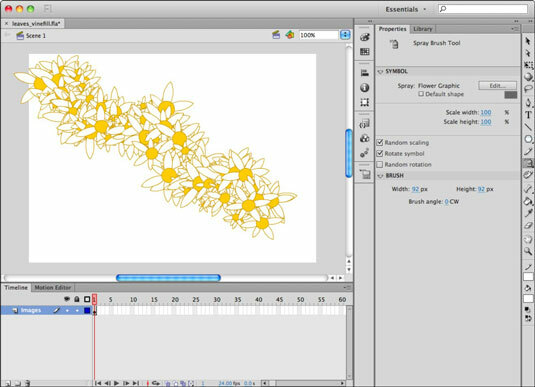 Adobe Flash CS6 features a tool that enables you to get truly creative with symbols: the Spray Brush. This tool can use symbols from your library, allowing you to paint random textures. The Spray Brush tool paints with instances of a single symbol from your library. You can use the Property inspector to dial in settings for scaling, rotation, and brush angle. Click the New Layer button, found below the Timeline, to create a new, empty layer to paint on. The Property inspector displays options for the Spray Brush tool. In the Property inspector, click the Edit button in the Symbol options area. The Select Symbol dialog box appears, prompting you to select a symbol from your library. Choose a symbol and click OK to close the dialog box. In the Symbol options area, use the Scale Width and Scale Height sliders to reduce or increase the scaling for each instance painted on the stage. In the Brush options area, enter values for the width and height of the brush as well as the brush angle, if you want. Click and drag on the stage to begin painting. The Spray Brush paints with the symbol you selected using the settings you chose in the Property inspector. You control the size, scatter, and scaling. The Spray Brush tool creates groups from all the paint droplets it leaves behind. You can break apart these groups by choosing Modify→Break Apart or edit its contents by double-clicking the group on the stage.